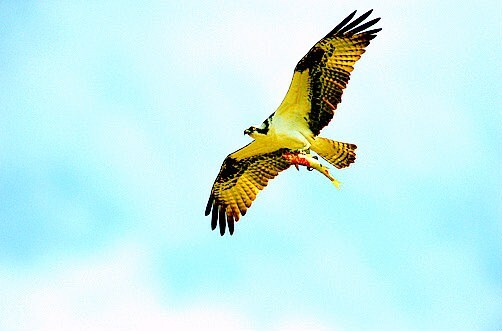 Osprey, hawk that lives besides lakes and on the coast. It dives from the air to seize fish with its talons. It has a short hooked bill, broad ragged wings and a white head; it has brownish-black plumage on its back and a cream breast. Two or three white eggs, spotted with brown, are laid in a stick nest. In Britain it has become a rarity. Length: 51-61cm. Family Pandionidae; species Pandion haliaetus.